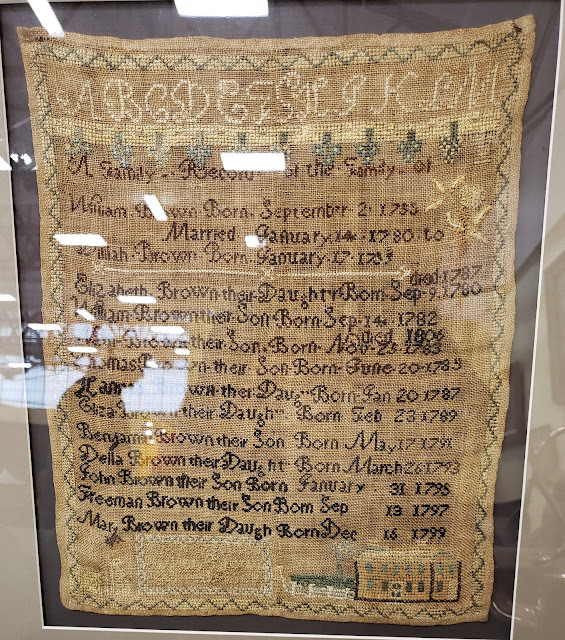 This sampler was hanging on a wall at a Maine antique show sponsored by the Camden-Rockport Historical Society over the weekend of July 21-22, 2018. The Boston exhibitor graciously gave permission for a photograph. Sorry for the reflections in the images! It records the birth dates and marriage date of William Brown and wife Diliah [? ], who were born in what appears to be 1755 and 1759 respectively and who married in 1780. It also provides the birth dates of eleven children, two of whom died young. 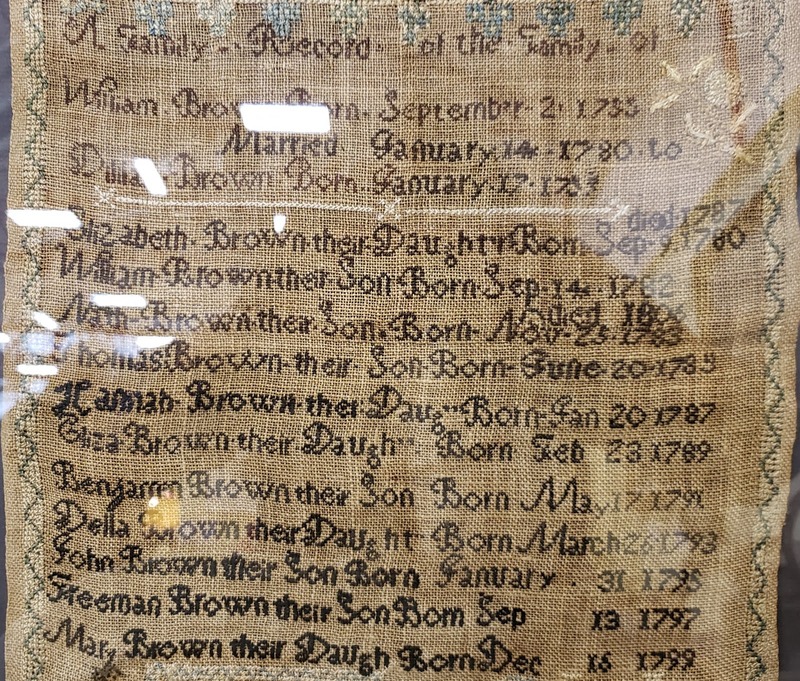 They may have been the William Brown and Delia Brown who are buried in the Orchard Hill Cemetery at West Bath, Maine, along with a Freeman Brown, all of whose dates roughly match the dates in the sampler. 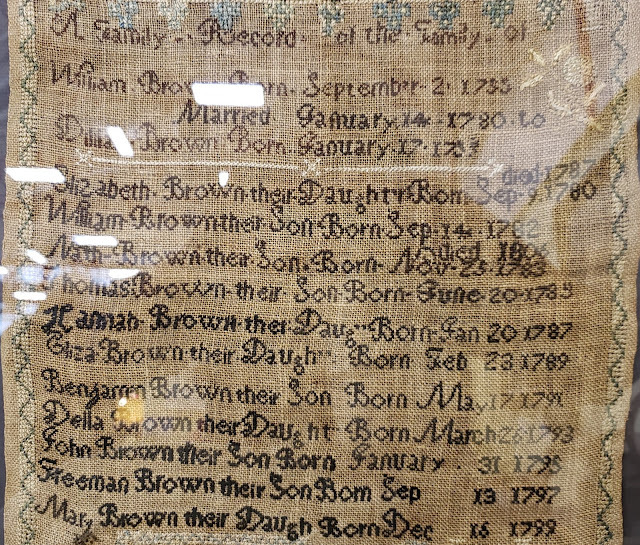 There's a William Brown, born in 1782 and died in 1861, buried in the nearby Lombard Cemetery at West Bath, Maine; his wife Joanna (Merritt) Brown had died earlier in 1836. An online tree has all of the information contained in this sampler but is otherwise unsourced and doesn't mention a locale. It also has the will of a William Brown attached to it, but I've since been told that the will was originally attached to the tree of a totally different William Brown and was apparently attached to the tree of William and "Diliah" in error. I'm wondering if the person who created the online tree saw the sampler at some point, in person or from images when it was earlier put up for auction, but didn't pursue any further clues to the family's identity. If you recognize the family above, whether from Maine, England, Massachusetts or somewhere else, please leave a comment or contact me directly. I have contact information for the owner, as of July 22, 2018, in case anyone is interested in tracking this sampler down. The price may have been on the reverse, but the sampler was hanging over my head over a display of breakable things. Sadly, in my attempt to photograph this and adjacent samplers, I didn't ask the owner for pricing.